“Celebrate!” says Three Dog Night. “Celebrate! 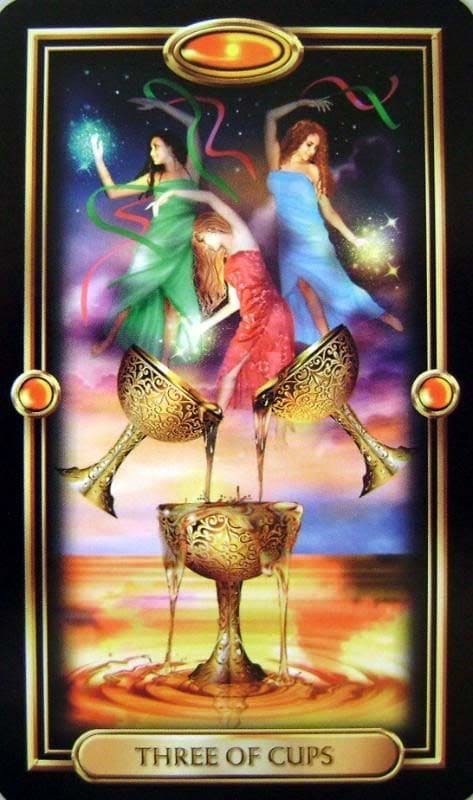 Dance to the music!” We all love a party and in the three of cups we get one. It’s harvest time, the grapes are all in and we can celebrate good food and friends. Three of cups and it’s time to dance. Too bad the time is so short. “Slippin’ away, sittin’ on a pillow,” says Three Dog Night, “waitin’ for night to fall.” It seems like no matter how good the party, the aftermath is always a come down. It’s no different in the tarot. Four of cups and it looks like we might have a hangover. We sit under a tree gazing dejectedly, inconsolably, at our three empty cups, so absorbed in our loss that we don’t even see a magical hand reaching out to us from the sky offering a rescue cup. I really like the four of cups, it’s very poignant. It brings to mind a moment in the office of my very favorite boss, when I was really wound up about something, probably waving my arms and stomping my feet. She kept trying to offer solutions but I wasn’t having any. She finally figured out I didn’t need a solution and said “so really you just want to be mad for a minute.” Of course that stopped me in my tracks, as it hit me she was absolutely right. I agreed, so we both crossed our arms and were mad for a minute. We laughed, I got over it and I went on with my work. Now that’s a great boss. A magical helping hand from the sky. “She whispered in my ear,” says Eric Burdon, “something crazy, she said, ‘Spill the wine and take that pearl. '” Go ahead and spill some wine, it’s not the end of the world. There is something to be learned from loss, we can come away from it with a pearl of wisdom. But in order to make use of that pearl, we have to actually take it and come away. There is a time to focus on loss so it can be understood, and then it’s the time to move on. But in the five of cups, we only focus on the loss, and not the pearls that may be in the cups still standing behind us. “Isn’t it a pity,” says Three Dog Night, “ready or not, gonna make it to the city.” Sometimes the best thing to do is to take some time to mourn your loss. 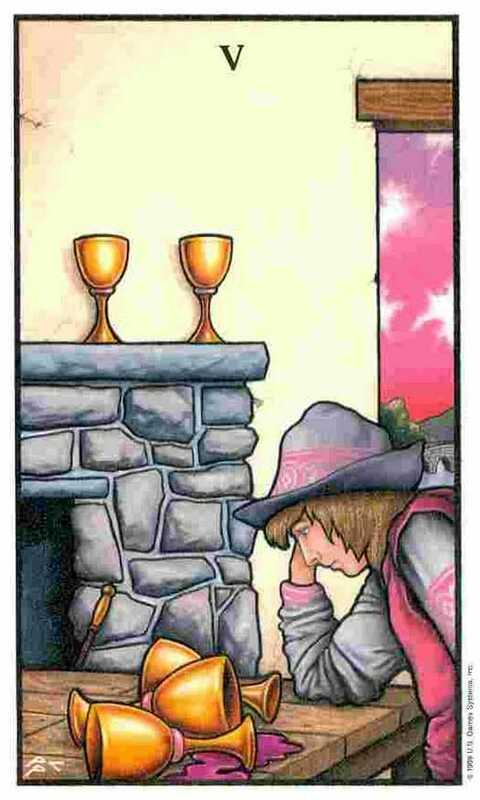 But it is frustrating from the outside looking in, seeing the two people in the four and five of cups so focused on their three empty cups to the exclusion of the ones they have remaining. We do need to have patience with the bereaved, even in smaller things than death, as my boss did. However, in the five of cups, it’s getting to be time to turn around and pick up those two cups that haven’t spilled, and get on with it. We can see the city in the distance, and there is a bridge to cross before we can reach it. “Maybe its okay…,” says Ani DiFranco, “because I picked you this bouquet.” Every traumatic situation, big or small, is a journey and these four tarot cards lay out a little trauma drama for us. We’re happy, we suffer loss, we mourn the loss, we’re happy again. The new happiness is like a rebirth, we are childlike again in feeling joy once more, and this is a tiny repetition of the cycle of the Fool. Beginning, middle, end, re-beginning. And with the new beginning, cups doubled and refilled, we once again get to celebrate. The Three of Cups is from the Gilded Tarot deck. 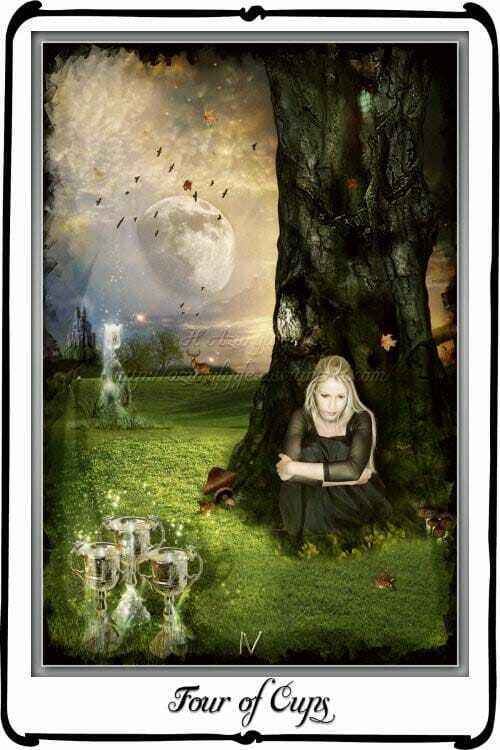 The Four of Cups is by Azurylipfe. 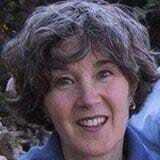 The photo is of Laura Horn, my best boss ever. The first Five of Cups is from the Connolly Tarot deck. 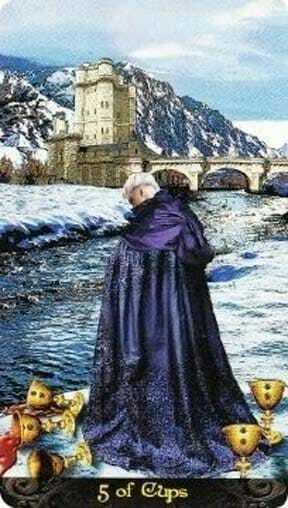 The second Five of Cups is from the Tarot Illuminati deck. 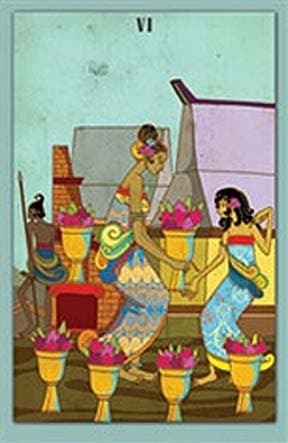 The Six of Cups is from the Tarot Nusantara.